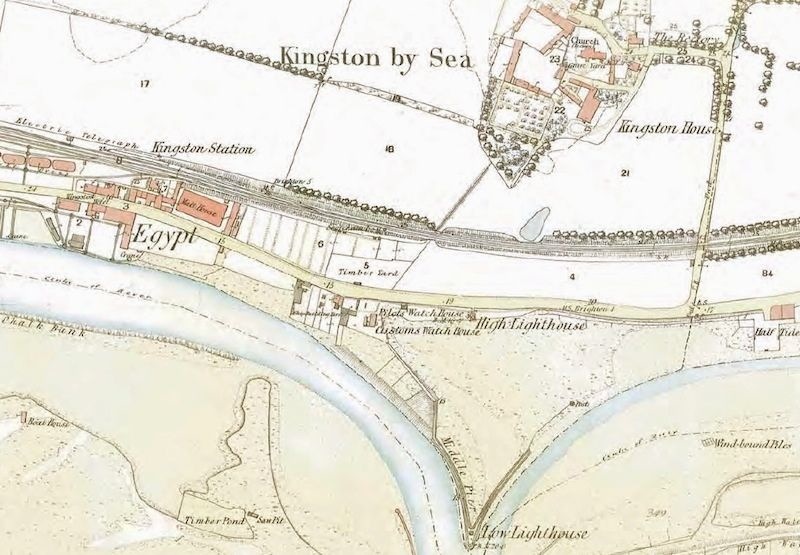 These early 19th century reminiscences of Kingston-by-Sea, Southwick, and Shoreham include pressgangs, the old London to Brighton turnpike road, servants and employees’ pay, shepherding, the harbour, shipping, people and events illustrated with maps and photographs from the galleries of Shorehambysea.com website. Additional information has been entered in blue to distinguish it from Rooke’s own dictation and at the end of his narrative a brief record of him and his family during their subsequent years in Southwick. There were sixteen or seventeen children at school. We used to learn the A.B.C. ; reading the Common Prayer and Bible; spelling, but no writing or sums. We went at nine, out at twelve, in again at two and out at four. The old dame used to walk with a stick that was possessed of many notches. If we did anything wrong we had to stand in the middle of the room and count the notches till we could count them right. She would sometimes make a fresh mark for us to count up to lest we should get too cunning. That house used to be in Southwick parish. All the land north of the Ashcroft Field (it used to be called the High Gate Field in these days) between Kingston Lane and Stony Lane was in Southwick parish till it was exchanged, when Mr Young became Rector of Southwick, for some land in front of Southwick Rectory, twenty-one acres I think. 2. 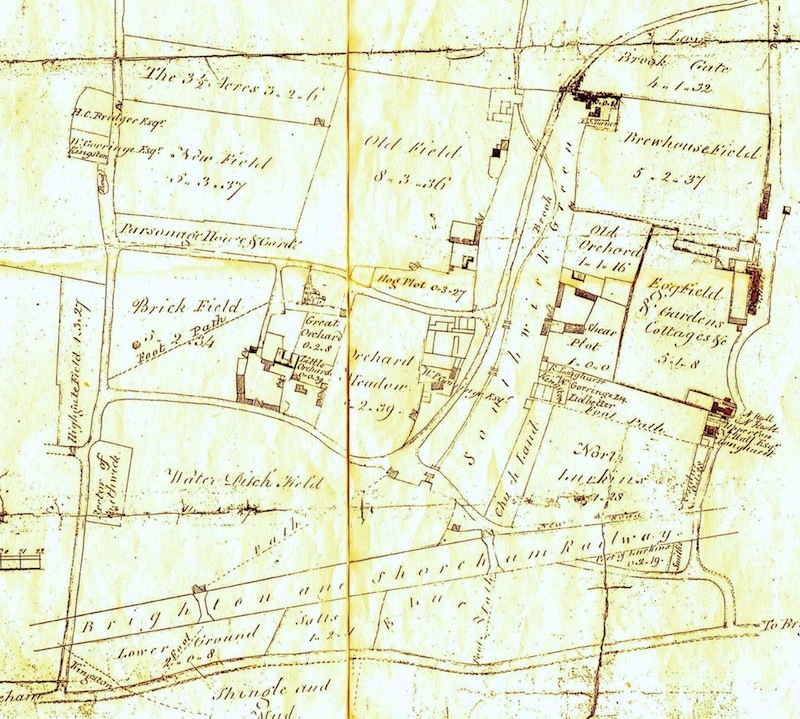 The 1841 map showing Highgate Field (left and the south-west view from Kingston Lane across the field towards Kingston Rectory and St. Julian’s Church – all now built over. 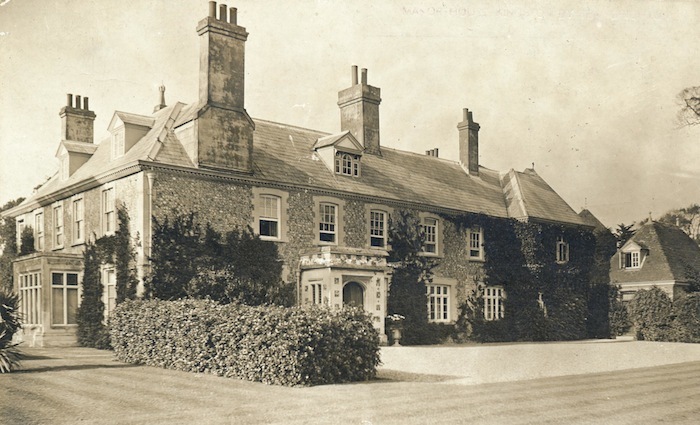 My father was coachman to old Squire Norton, (John Norton, Justice of the Peace, High Sheriff and Collector of the Customs during the 1790’s) and when he died (1798) and Mr Gorringe (William Gorringe) came to the estate he went on with him. He was born in the old thatched cottage at the top of Kingston Lane in Southwick that was or Kingston that it now is (There were a number of old cottages that used to stand at the top of Kingston Lane just above today’s Kings Manor School). His father and grandfather were born there also. Three families, man and wife, were all of the same name, ” Thomas and Ann Rooke.” The cottage formerly belonged to the Welfares. The initials are over the door. ” W.S.W.”. William and Sarah Welfare. Formerly there was a barn on the north side, but I only recollect the ruins. Mr Gorringe (“Lord of the Manor and owner of the whole Parish” – 1820 Directory) used to have one of the old-fashioned chaises and my father used to drive him about. He used to ride to London and back on one horse in one day. 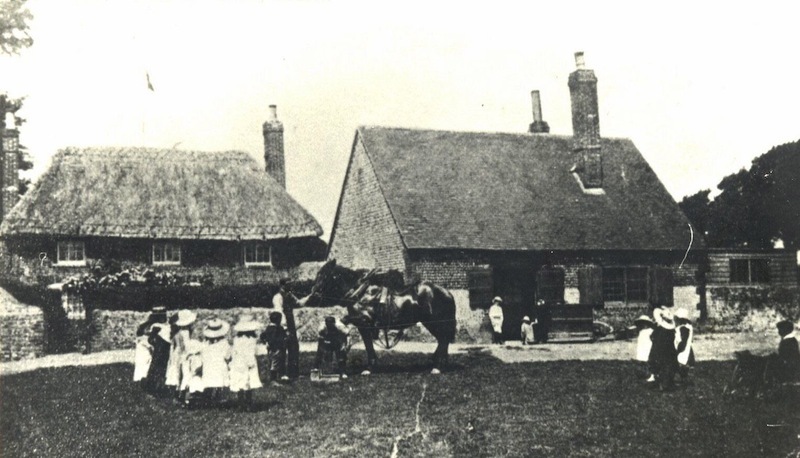 He had a farm at Horselunges, Heathfield. 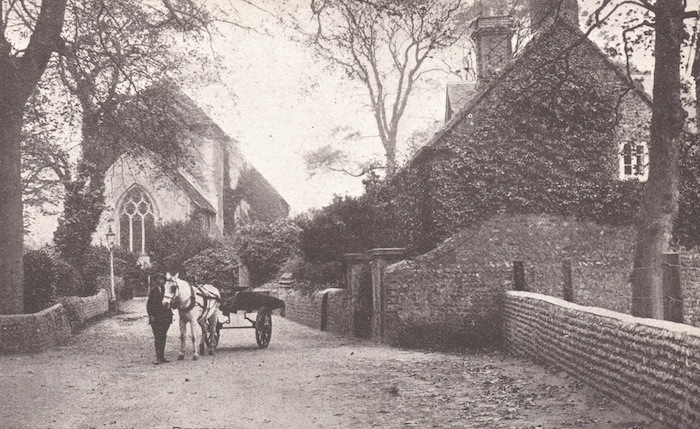 He would get up at three o’clock, call up his foreman, who used to live where Mr Purton (Kingston Vicarage) now lives, ride off to his farm and be back frequently by nine or ten o’clock. He was a wonderful businessman. He could put his hand to anything that wanted doing. He had a lot of fine sheep. They used to be considered the best anywhere about. He used to feed them on hay on the Slonk (i.e., Slonk Hill behind Kingston). In the winter they were not shut up at all except during the lambing season. They were out all weathers. I remember seeing hay carried out to them when snow was on the ground. Old Shepherd Johnson was the first shepherd I recollect. He lived on Southwick Green in an old-fashioned thatched cottage between Gasstons (the Cricketers’ Arms Inn) and the shop. There was a large garden at the back, and the door was so low you could hardly get in. The sheep had bells and used to fold on the hills at night except when the weather was fine when they would fold on the plough at sunset in the summer. When it was quite dark you could hear the bells of an evening and I would know that the sheep were being folded. In the summer men would work from six to six. In the winter from dawn to dusk. The tithes used to be taken in kind. The lambs were tithed when they were weaned. They were put into a pen with an opening at one end and driven through by the shepherd, one at a time. Every tenth one was the clergyman’s. The Rev. Samuel Prosser (Samuel Prosser, Rector at Southwick 1795 – 1825) had three out of forty and Mr Gorringe the fourth. Mr Gorringe used to stand on one side and the Rev. Samuel Prosser on the other. If the shepherd saw a good lamb coming he would try and dodge it for his master. The Rev. Samuel Prosser would be very angry and words would follow. The corn used to be tithed, (a tax on produce or income used to support the clergy or church) so many sheaves, twelve usually in a shock. The man would go round, count and take three out of forty and stick in an elder bough. The fourth used to go to Mr Gorringe but no bough was stuck in that. Eggs and pigs were also taken in kind. I used to go after them at Mr Hall’s (Nathaniel Hall who owned the Manor Farm in Southwick Street), but never for them at Kingston. I never heard about cattle. If Mr Hall had a dozen eggs he would send word and I would go and fetch one. They used to tithe the milk every morning. All this on Mr Hall’s’ farm. This used to be called the small tithe. The large tithe was not taken in kind. Mr Gorringe was a tall, strong-built man six feet high, very hearty and very fair. Mrs Gorringe was very tall also. They kept a cook, kitchen maid and one housemaid. The cook and housemaid had from £5 to £8 a year. Servants were hired from Michaelmas to Michaelmas. Brewing was done in the house and my father used to brew. There were two men and two boys lived in the house, and whoever was downstairs last in the morning had to fill the bottles of beer for the men’s lunch during his breakfast. (Later records show two female and two male servants who lived in – the women were usually about 20 years of age but the males, boys really, were generally around 15 although there was an older man at one time who worked as both a groom and gardener. William Gorringe is shown as a farmer for the farm alongside the House. 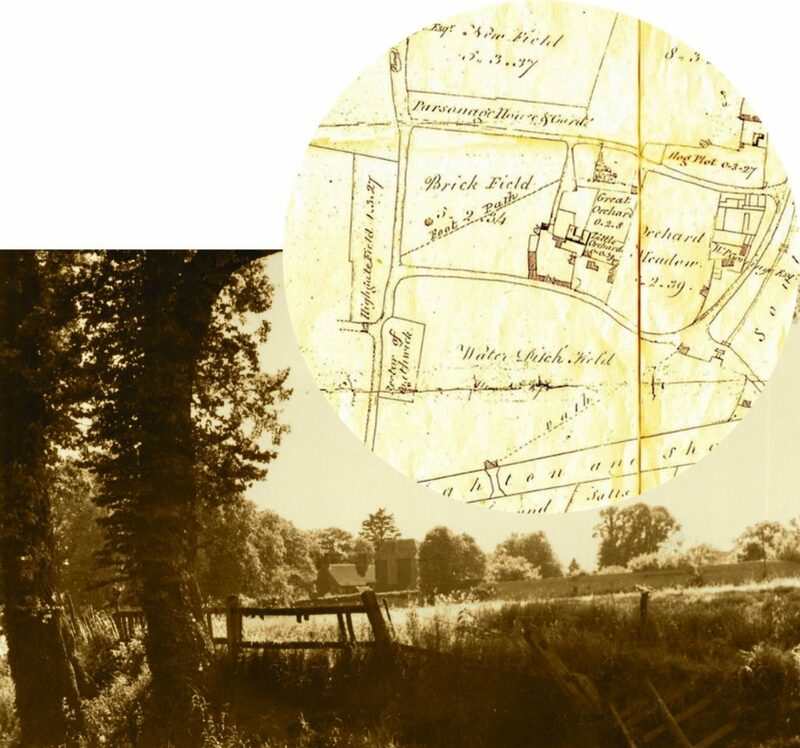 The estate consisted of 700 acres and his workforce would have been made up of agricultural labourers from Kingston and Southwick parishes. One of them lived in the rectory in St. Julian’s Lane with the vicar and we know from Rooke’s earlier comments that the shepherd from Southwick also worked for him). Breakfast was pork and a basin of milk. Pork and bacon were the principal of servants’ food. They had tea in the afternoon. In harvest time, if the men worked well. Mr Gorringe would give them Dark Cellar Sop—bread soaked in strong beer, a very good thing for the health. If the men or boys transgressed at all they used to have a day at the grindstone. On Sundays all servants had to go to church once, and at nine o’clock in the evening the key was taken to Mr Gorringe. If any came in late they had to go before him and state where they had been. The female servants at that time used to wear on Sundays a nice clean cotton dress, good and neat, and well they used to look, not aping their mistresses. The servants were hired from old Michaelmas to new Michaelmas so that they should not become parishioners. If anyone lived a year in a parish they became a parishioner, so if servants were going to stay on another year they used to have their boxes taken cut of the house and they had a week’s holiday. Then they started fresh. By this means they avoided becoming parishioners (and thereby becoming a possible burden on the parish). Tradesmen always paid their men at a public house on a Saturday night. They had from two shillings to three shillings a day, the top price of £1 Is. a week, though higher in Brighton. Labourers had from ten shillings to twelve shillings a week and they were quite as well off as they are now. They used to be plain and respectable. No outings and holidays as they have now. The day after Christmas Day was the head holiday of the year, and if they did not have a holiday then, to go to Steyning Fair on Michaelmas Day was a great amusement. Servants would go there to be hired. 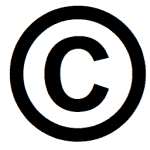 A carter would put a piece of whipcord in his hat to show that he was for hire. Carters used generally to be indoor servants. Masters would have one or two married men, but the rest were young men to train and who lived in the house. Master Ridley. Mr Gorringe’s Bailiff—he lies in Kingston churchyard—had the privilege of keeping a cow, and his wife used to sell milk to the parishioners. 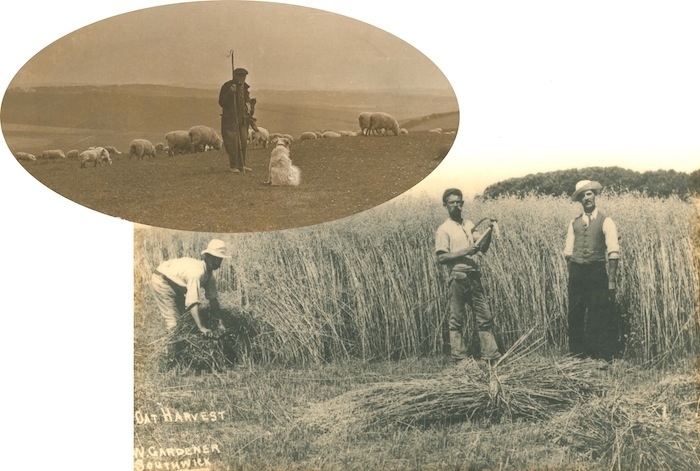 Shepherd Johnson had the privilege of keeping ten ewes and their lambs, but the lambs had to be sold at weaning time. As to provisions salt was very dear in these days. 2/6 the gallon: pigs 2/6 the stone of 8 lbs. Hardly anyone but had a pig—one pig in the tub and one in the pound. Hardly anyone ate butcher’s meat, but people were much stronger and healthier than they are now. My mother would think nothing of walking over “the Hill” to Ditchling and back in one day to see her old home twenty-four miles at least. I used to walk from Horsham on a Saturday evening after I had done work (about 20 miles – both were daunting walks for most people nowadays revealing just how far people were prepared to walk then). I would start at seven o’clock through St Leonard’s Forest, pass the Crab Tree over Tottington Mount, (the hill south of today’s Tottington Manor between Edburton and the Henfield Road. In those days there was no road alongside the east of the River Adur and travellers still used ancient tracks across the downs) getting home about two o’clock; start off again about seven on Sunday evening and be ready to begin work again on Monday morning at six o’clock. Mutton and beef were from 5d. to 8d. the pound. Flour 1/9 to 2/ – the gallon. Potatoes 2/6 the sack. Farmers used to plant a good many potatoes and then if anyone wanted them they would go up to the field and buy them at 2/- the sack, as many as they liked. Sometimes a farmer would sell an acre at a time. They mostly planted the “Jersey Blue.” a very late and splendid potato, planted late in May and not ready to dig until November. Butter was 10d. to 11d. the pound. Wheat from £30 to £40 the load, but the usual price was from £30 to £35. 7. The Kingston Inn (previously the Blue Anchor then Kingston Arms) stood on the north side of the Brighton Road in the area known as Egypt. 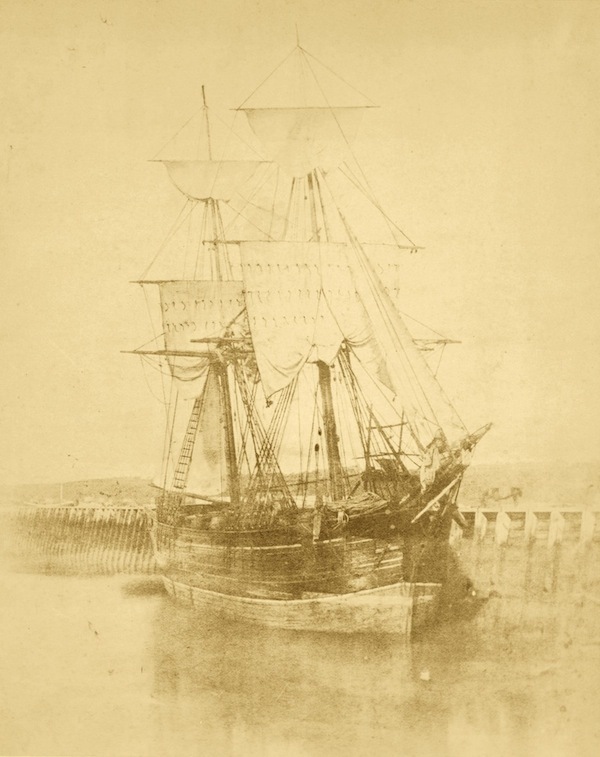 The Schooner was built on a steep bank facing Albion Street with the rear above the old turnpike road and harbor. I was seven when I went to work for the Rev. Samuel Prosser, and I stayed until I was fifteen. He had three livings: Southwick. one at Stroud, near Rochester, and another at Chatham, near Canterbury. Mr Hooper, from Sompting, was clergyman for Kingston (Thomas Poole Hooper, vicar of New Shoreham 1802/1815, Vicar of Sompting March 1815 to1837, Rector of Kingston June 1815 to 1837). No clergyman lived in the parish. Mr Hooper used to drive over on Sunday and do one service. The clerk was a man named Cheesman who kept the Blue Anchor public house (the Cheesmans also had a timber business at Abion Wharf, Southwick). I used to go with the Rev. Samuel Prosser in a horse and chaise. We used to stop at Mayfield one night when we went to Stroud. We have driven from East Sutton, near Maidstone, in one day. He had a nice house and farm there as well as his living. He was a very stout man, so stout that he could not get into the chaise if the horse was in. We used to get him in with chairs. In church he had to be pushed into the reading desk and pulpit and would call out, “Hobden (the clerk) (Demetrius Hobden is shown as the parish clerk in the 1841 Poll Book and as landlord of the Victory Inn in Albion Street during the 1830’s! ), you must push harder or I shall never get up.” We used to push him down to the church in the dung cart and tip it up for him to get out. There was one service on Sundays. There was a gallery in the church and a very good choir of fifteen or sixteen men and very good music. Several old gentlemen played. Mr Morley played the violin (William Morley a blacksmith who’s forge was on the northwest side of The Green), and Mr Hicks the miller, who lived at the old house by the Windmill Inn played the clarionet (Edward Hicks –the mill stood on the north side of the Old [Upper] Shoreham Road opposite the junction with Roman Road). Master Young (Daniel Young), a shoemaker, used to pitch the tune. They had hymn tunes. There was no chanting. The cottages at Southwick Rectory Gate were a barn when I can first recollect. Before that they were used as barracks for soldiers. 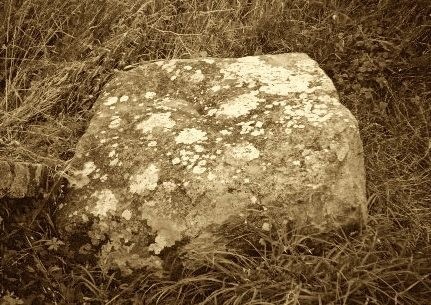 The large stone on Southwick Hill now used, as a boundary stone and called ” Rest and be Thankful,” was built in the wall of Southwick Churchyard Just opposite Master Hobden’s house, where the road was very narrow. The wall was set back to widen the road and the stone was given to Mr Gorringe. Mr Prosser had the right to turn out 32 or 36 sheep on the Green. The old cottage where I was born had the right to turn out three pigs there. The old house at the north of the Cricketers’ inn, which I pulled down some years ago, had the right to turn out cows there. 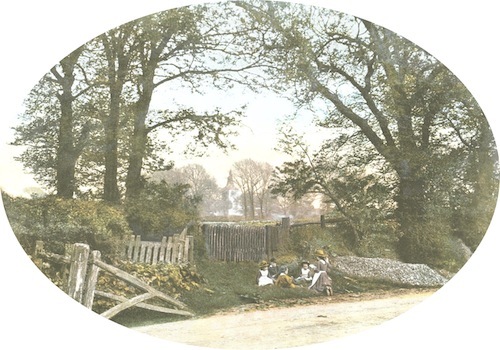 Southwick Farm (this was in Dark Lane, later renamed Park Lane) had the right to feed sheep on the Green. Hall’s had only the right to water their sheep at the pond. King Charles’ House had only the right to feed pigs. I never heard that anyone had the right to turn out horses on the Green. Sometimes on a Sunday they would turn them out but not on other days. There was an old house and malthouse at the top of the Green at the north-west corner. Smith lived there (John Smith recorded in 1820 owned and worked the malthouse with others). The blacksmith’s house and shop is very much the same now as it used to be when I was a boy. Four generations of Morleys have lived there to my knowledge. The little angle of garden to the east of Smith’s was formerly on the Green. They put a temporary fence at first and as no one said anything they took it in. Other little bits have been taken in this way. The wheelwright’s shop is much as it used to be, (on the west side of the Green) only there was a fence outside that came round by the tree to where Manvil’s house now is. My first wife – her maiden name was Luckins – planted the tree by the wheelwright’s shop. The old elm tree that stands by the cottage in Kingston Lane where I was born was about three feet high when I first recollect it. The elm trees used to stand at the west of the garden and then right across to where the well now is. The trees in Kingston Lane were old trees when I was a boy and I used to go birds-nesting in them. Opposite the present lighthouse a private carriage road came up to Kingston House. It was shut by a common bar gate and there was a quick hedge all the way along. I was working for Mr Thomas Goddard and helped to build the wall that now bounds the north side of the road. The Watling Lane was really a lane in those days. There were gates to all the entrances to the Green. Nothing could get on to the Green without going through a gate. It was much more private than now. The Manor Pound was at Shoreham just below Adur Lodge. 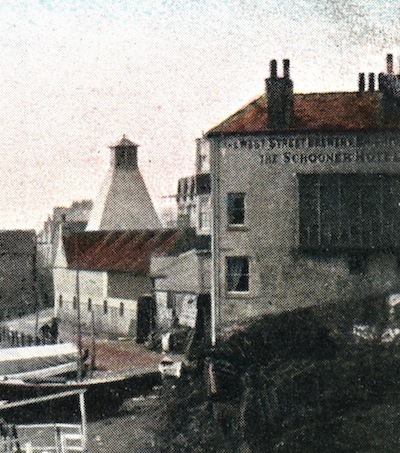 There were no houses in Southwick below where the railway now runs except the Schooner inn, Mr Penny’s house (Robert Penney ran a world-wide shipping line from his wharf in Southwick), the Victory inn and one little cottage where the sail loft now is. All was meadow. There are some Roman remains and pavements in Southwick opposite to where the “Romans” now stands (a Roman villa that stood on the north corner of Southwick Street and Manor Hall Road – “Romans” is a 19th century house in Roman Road and further north than the actual site of the villa.) The walls were knocked down to allow of the land being ploughed over, but they are still in the fields on the east of the road going to Portslade, opposite the south angle of the three-cornered piece. I should judge that they are now about two feet under the surface. The plaster was on the walls and they dug down to the floor of some of the rooms, but not all of them. It would be about 1815 that I saw them bare. The old turnpike road from Brighton to London used to pass Kingston Barn about a hundred yards from the top of Kingston Lane to the west. There used to be a way past there. The road turned off, passed the elms where the Holm Bush buildings now stand, up past Kingston Barn and Mossy Bottom Barn. There passengers had to get out and walk up the hill to Beeding Bostal and walk down. It used to take two days to drive to London. The first stage was Horsham where they stayed the night. They did not travel in the night. Heavy coaches and heavy horses were used and the mails were carried by them. (An alternative route that went past the then coaching inn at New Erringham then over the downs to Castletown and on to Steyning. The usual Brighton to London coaching route seemed to have been up the Dyke Road, Devil’s Dyke, Saddlescombe Road then Henfield until 1810 when the Bolney turnpike opened.) In the deep snow during 1837 the Southampton coach coming along the coast road was stopped at the Schooner inn and stayed there many days. 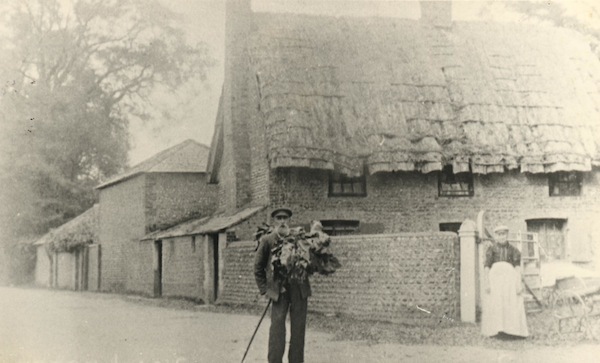 They gave a man one guinea to carry the mails along the beach into Brighton. I remember the sea breaking in and coming up to Church Lane on Southwick Green. A great balk of timber was washed up. It washed down a little canteen that stood on the beach and made a hole through the shingle. I remember seeing Upperton’s father in a boat on the Green. We used to play cricket on the east side of the East pier. 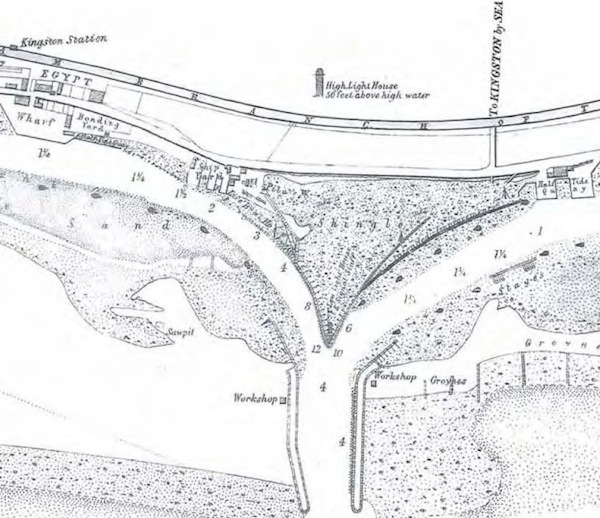 I can remember the mouth of the harbour where the Gas Works now stand at The Wish (the easternmost end of the harbor at Aldrington basin): that would be in 1810 or 1811. I can remember the present harbour being made. There was only a hole in the beach at The Wish, no piers or buildings of any sort. There was a way for ships to come up to Shoreham. Ships from 150 to 200 tons were the largest. They went as far as Old Shoreham Bridge, the only bridge then. I remember the Press Gang. They would come on shore twenty or fifteen strong and take whoever they could lay hands on. If they saw a team with a man and a boy, they took the man and sent the team home with the boy, unless the man was old. If the lad was a tidy lad, they would take the lad and send the old man home. They dare not take both. The man would hide if he could. I remember a wagon coming with corn from Saddlescombe by White Lot. The man heard the Press Gang was about and hid under the covering and the boy drove on. The Gang took possession of the wagon, searched and found the man and carried him off. I remember the Emperor of Russia and the King of Prussia coming to England. We were looking out several days for them and one Sunday we saw them come trotting along in their carriages. They had long beards down to their knees. They were on the Old Shoreham road on their way to London. 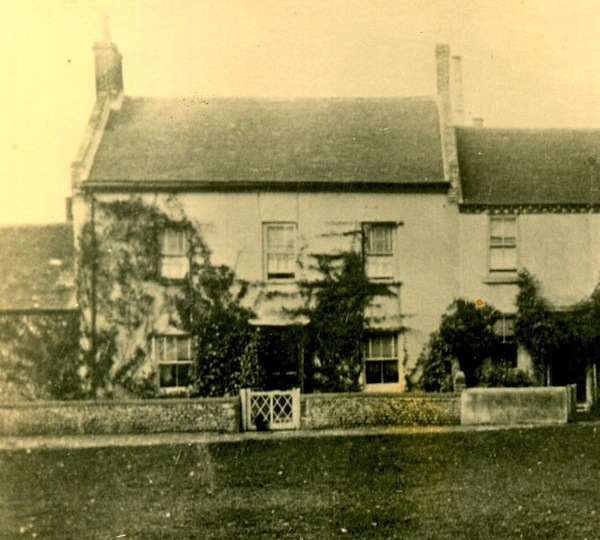 His first marriage was to Jane Luckins, perhaps a relative of the family that gave their name to Luckins Field at the south-east corner of The Green since at least 1780. 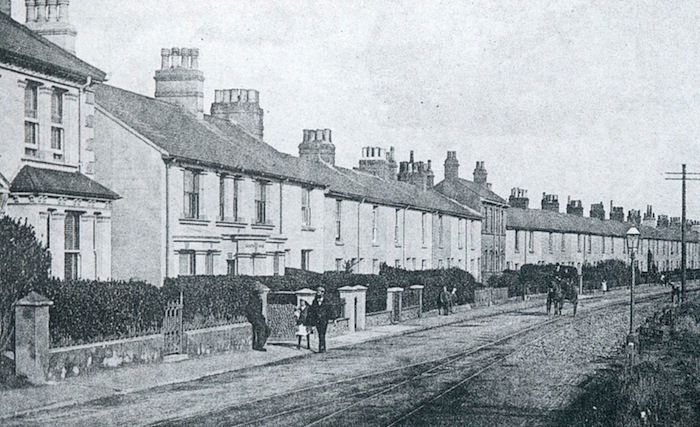 Initially living in Albion Road they moved to The Green by the early 1850’s. They had eight children – eldest son James junior joined his father in the building business. Jane was not to make old bones and died in 1852 following which James remarried three years later to Sarah Ann Butler by whom he had further children, daughters Lydia and Fanny. 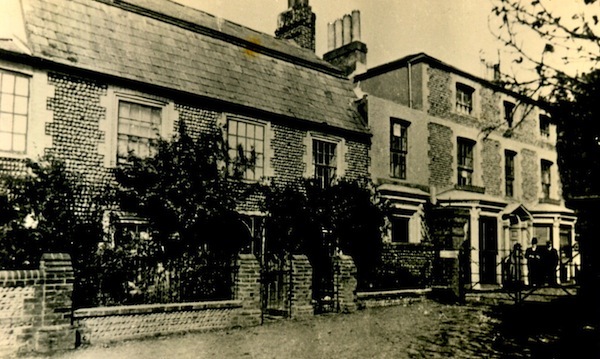 After thirty years living at The Green the family moved back to Albion Street, at 39 Adur Terrace, where James at the age of 75 was still shown working as a builder. He died 21st December 1889 at Adur Terrace leaving £976. 7s 9d to his widow Sarah Ann (equivalent to around £90,000 today) and she, with her two daughters, remained at the Albion Street address supplementing their income by running the property as a lodging house. 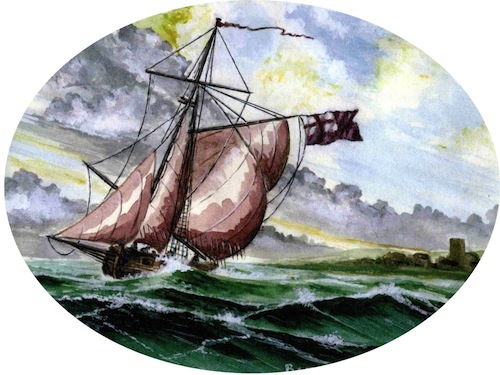 Sussex Archaeological Society (Marlipins Collection) 1 – 89.1158; 2 – 14.210; 3 – 91.1683 and 94.2561.9; 4 – 89.1163; 5 – 89.1165 and 89.1273; 7 – 14.147 and 89.1050; 8 – 93.2138; 9 – 89.368; 11 – 89.366; 12 – 89.353 (detail from); 14 – 89.381; 15 – 95.2605.15; 18 – 89.1040 (detail from); 19 – 14.4022. Peggy Bailey Collection 10 – pb16f. West Sussex Records Office 6 – OS 25 inch 1st Edition 1861; 13 – 1841 Southwick; 16 – Add Ms 20, 109.